My Den: Back From The Dead And The Indomitable Spirit Of Charmaine Tan. Back From The Dead And The Indomitable Spirit Of Charmaine Tan. Sometimes, there are moments in our lives when things happen that changes the way we look at and live our lives. One of these moments occurred to me some three months ago when after dropping my kids at the school, a monster of a truck, against the flow of traffic, came charging at me after I did a right-turn. The thoughts at that moment : "Damn, this is it." and "What about my kids? ", the impact and the resultant black-out remained vividly in my mind three months down the line. Waking up in the hospital, disorientated and unable to move my legs, prompted another worry that I might be paralysed. Well, I am not dead and neither am I paralysed. Guess somebody up there was looking out for me but the accident broke both my legs and right arm, fractured my hips and landed me in hospital for the past three months. Moments like this reminded me of the unpredictability of life, of the importance of your loved ones and not taking them for granted, and more importantly, spending as much time as possible with my family, especially my kids. In the face of what I just went through, all other pursuits and considerations are actually distractions and are secondary. There is an old saying that I could not remember in its entirety but it goes something like this : "I come this way but once, so any good...." Essentially it means that we live only once and we should be kind, compassionate and do as much good as we can while we are here. So, I intend to be less critical, more accommodating, compassionate and open-minded to others. And where possible, volunteering at some of the local charities. While the focus of this blog will still be on books and the literary scene, my blogging will also take on a social bend, using my various blogs to promote social causes especially for the less-privileged. Besides the change in perspective, there was another lesson learned - strength in adversity. This was largely due to an elderly gentleman, Marcus, who was my next-bed neighbour and in for colon cancer treatment. Though clearly in pain, Marcus showed remarkable courage in facing his condition and also much grace in cheering me up during my hospitalisation. A fellow book lover, he also related a story that touched me profoundly - a story of courage, of dreams and hopes. Charmaine Tan is one of the authors of the book "Pick Me Up", a community project by the "Make-A-Wish" Foundation Singapore. Her story, “Ceryni’s Secret”, is one among a compilation of short stories written by more than 40 people for the book - a collection of true stories about how people overcame their circumstances and turn their dreams into reality. Nothing unusual about a published author except for the fact that she has a congenital eye condition which visually-impaired her, losing 95 per cent of her eyesight, and is also suffering from end stage kidney failure. Despite her sickness and disability, Charmaine's love for writing resulted in “Ceryni’s Secret”, a 12,000- words story written in three days and it represented her first published effort. It also fulfilled her dream of being a published author. When Marcus told me the story of Charmaine Tan, I realised, besides encouraging me, he was also drawing strength and inspiration from her, vis-a-vis his condition. The story of Charmaine Tan epitomised determination, courage and strength in adversity and with strength in adversity, the fulfillment of hopes and dreams. All the more so for Charmaine. You see, Charmaine Tan is only 13 years old. 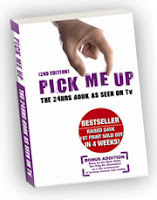 *Readers who wish to order the book can drop an email to : pickmeupbook@gmail.com or visit the Pick Me Up website. All proceeds from the sales of the book will be donated to the Make-A-Wish Foundation. *For regular readers of this blog, please be patient as it will take some time ( for my right arm to heal ) before I can resume regular posting. I am so glad you are on the mend and not paralyzed. Geez - what a trial you've been through. Take care. Thank you very much for the kind comment. And yes, it's been a trial and a frightening one. Will be sometime though before I can resume blogging regularly as my right arm is still not fully functional. Being right-handed, coming up with this post took me hours using only my left hand. Once again, thank you very much and take care. hey, though i don't know you personally, so sorry to hear about your accident, but happy for you that everything worked out way better than it could have. Thank you very much for your concern and I am thankful that I have been given another shot at life. Once again, thank you for your kind comment. Take care. which if we can survive and learn from, I believe, will progress us in the quest of becoming better, happier human beings. Thank God, you're a survivor. I hope you're mending well, and I'm very glad to read your blog again. The story of Charmaine Tan is touching and amazing. An inspiring young girl with a purpose. Very best wishes to completely regaining your health. the accident was a blessing in disguise. As for Charmaine, I actually met her at the book fair where she was promoting her book and this is one gutsy little girl. Pint-sized and wheelchair bound, her courage would put a lot of adults to shame. Take care and thank you very much for dropping by.